Frittata of leeks and ham, lemon sole ceviche & Amalfi lemon ice cream. Our Wild Culture Chef delivers a simple and delicious menu in the waiting room between seasons. SOMERSET, ENGLAND — We’re not completely out of the depths of winter quite yet, but — dare I say it? — I think that spring may be on its way . . . at least across most of Europe. But, for those of us sticking it out at home in these chilly months, patiently waiting for the warm weather to make an appearance, a big question remains: What can we be eating and cooking to warm our hearts, nourish our souls and make the most of what’s in season right now? The seasonal question, of course, does depend greatly on where you are in the world. But in the northern hemisphere, we seem to be somewhat in the doldrums food-wise, with seemingly little local produce to excite or sustain us. However, there are some brave veggies starting to emerge from the soil — plus, the seafood situation is looking up, with some wonderful flat fish and shellfish to be found in the cold waters. This is also the time of year to bend the rules when it comes to local sourcing. The abundance of imported citrus and tropical fruits at this time of year are an absolute god-send in the winter months, a sure-fire way to lift your mood and give your body a much-needed boost of colour and vitamins. These recipes are all great for simple, elegant entertaining. They can all be prepared in advance, which gives you the perfect excuse to invite over a few friends, catch up after a winter of hibernation and toast the upcoming spring. Leeks are some of the first vegetables to grace us with their presence and, cooked right, they give a rich sweetness to dishes. This is my go-to recipe for a relaxed lunch — it is fabulous right out of the oven, but you can also make it in advance and cut it into squares to serve with drinks as a delicious snack. Heat the oven to 170℃ / 340℉ fan oven or 185℃ / 365℉ normal oven. In a large frying pan, gently fry the leek in 1 tablespoon of the olive oil and the butter with a little salt and pepper for about 5 minutes until they are soft and just starting to go slightly golden. Add the ham and cook for 2 minutes more. Leave to cool a little. Whisk together the eggs, flour, cream, salt, pepper, most of the cheese and the herbs. Add the leek and ham. Heat the remaining oil in the pan and pour in the egg mix. After a minute or two, us a spatula to allow uncooked egg to flow beneath the cooked layer. Cover with a lid and cook for about 5 minutes over a medium heat (make sure the bottom doesn’t burn) until the outer 1-2cm (½”) of the frittata is set, but still a bit runny in the middle. Scatter over the remaining cheese, put the frittata in the oven, uncovered, for about 6 minutes until just set. If you wish, you can grill the frittata for the final minute to brown the top. Using an oven glove to hold the handle, remove the pan from the oven and, with the help of a slice, ease the frittata onto a large wooden chopping board. Slice and serve warm or cool and serve later. 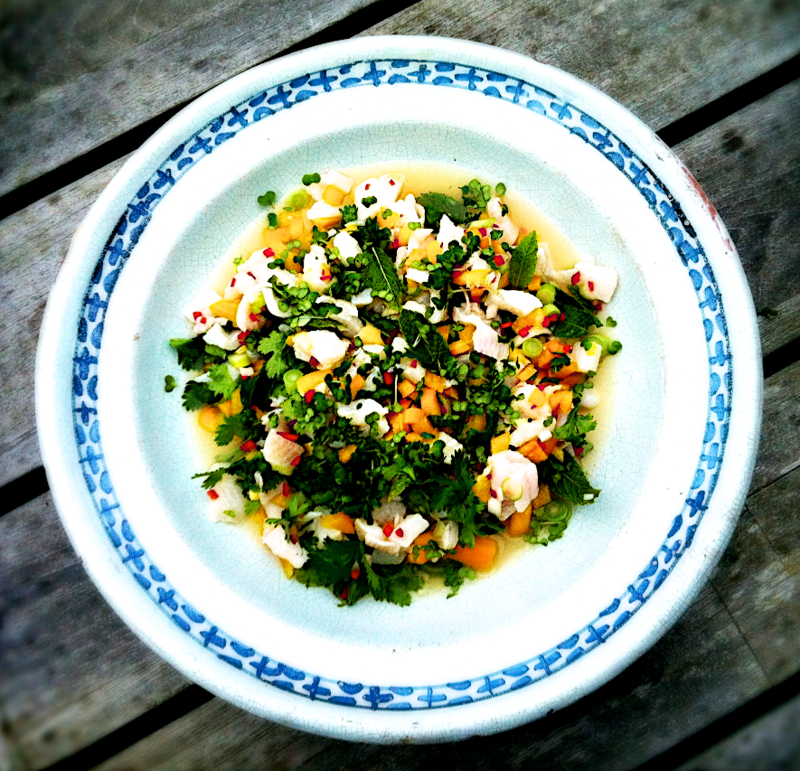 This is actually a photo of a recent dish, Scallops & Mango Ceviche — but the same general idea. I have enjoyed eating ceviches in restaurants around the world but it wasn't until I moved to Cornwall, with all its wonderful fresh seafood, that it made sense to start making them. I love to use the wonderful local lemon sole, which is so fresh and has a light flavour and delicate texture, but other soles and sea bass work really well, too. Put the fish, red pepper and spring onions into a bowl, cover and keep in fridge until needed. In a jam jar, mix together the lime juice, salt and chilli — keep this in the fridge, too. 10 minutes before you’re ready to serve, mix together the fish, red peppers and spring onions with the lime juice, salt and chilli. Immediately before serving, mix in most of the herbs, lay it all out on a platter, drizzle over some olive oil and sprinkle with black pepper and the remaining herbs. This is a real show-stopper of a dessert and it’s really worth using the best organic lemons you can find. It looks impressive and the flavours are so vibrant — what’s more, you can prepare all the elements in advance, so there’s no last-minute rush. To prepare the candied lemon, place the sliced zest in a small saucepan, cover with water and bring to the boil. Strain the zest and plunge into cold water. Repeat the process three times. Pat dry with kitchen roll and mix into the sugar. This will keep for up to a week in an airtight container. Prepare the lemon ice cream the day before (if you wish to make your own in an ice cream machine, please see the recipe below, which will make more than you’ll need). Remove the ice cream from the freezer, allow to soften for half an hour, mix in the zest, juice and limoncello and refreeze. For the jelly, cover the gelatine with cold water in a bowl and soak until soft. Meanwhile, in a saucepan, heat the Prosecco with the sugar until it has dissolved. Remove from the heat. Drain the gelatine and add it to the Prosecco mixture. Stir well until the gelatine has dissolved. Add the elderflower cordial, vodka and gold leaf and mix well. Pour into individual jelly moulds and place in the fridge until set. This should take 4 hours. To make the lemon curd, bring the lemon juice to the boil in a saucepan. Immediately remove from the heat. In a bowl, mix the sugar and egg and add to the lemon juice. Return the saucepan to a medium heat and whisk continuously for about five minutes until the liquid begins to simmer. Remove from the heat and slowly whisk in the butter. Sieve into a bowl, cover with clingfilm and refrigerate. To serve, dip the jelly moulds in a bowl of just-boiled water to loosen the jelly and turn out onto four plates. Spread the lemon curd to the side of the jelly and serve with a scoop of Amalfi lemon ice cream, topped with candied lemon. Makes 1 litre / 2 pints. Whisk the egg yolks and sugar in a bowl or food processor until doubled in size. In a heavy-bottomed saucepan, bring the milk, cream, vanilla pod and seeds to the boil. Remove from the heat, lift out the vanilla pod and pour into the egg mixture. Sieve into a bowl and chill before churning in an ice cream maker. Once churned, turn out into a container and freeze or add more ingredients while still soft, then freeze. 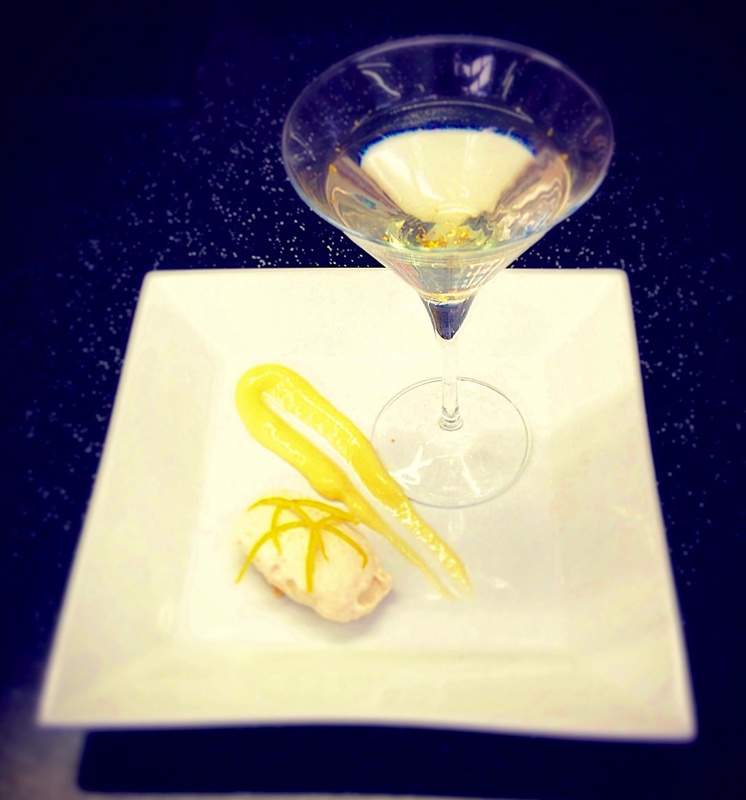 • Iced limoncello — though I think it tastes like alcoholic icing sugar! • A cocktail of proscecco and elderflower cordial (you can use what is left over from the recipe — a good solution!). This article was first published in The Journal of Wild Culture on March 27, 2015. LAURA POPE works as a private chef to clients in the UK and abroad. She has also cooked in various establishments worldwide — from a boutique hotel in the southwest of France to the restaurants Chez Panisse in California and Ottolenghi in London. Laura teaches cooking, blogs and has created gluten-free recipe apps for the iPad. See Laura's site. PHOTOS by the author, except for Fritta with leeks and ham >. Stadium Fervor as Renewable Energy!